The main objective of Business Intelligence is to bring the right information at the right time. Usually, the data is pulled from several sources and transformed into accurate and consistent information which is stored in the Data Warehouse. 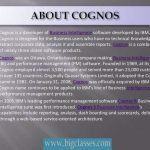 Now Cognos is one of the largest suppliers of Business Intelligence Tools globally and the name is recognized as a leader in their field of Business Intelligence reporting. Cognos 8.4 BI combines all the features of the earlier Cognos products and provides a complete BI solution for corporate business information management and reporting. 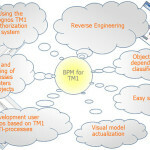 Cognos 8.4’s architecture is entirely different from the old versions of Cognos. All the components are integrated with one another. This component of Cognos is used to create and manage more advanced reports. Report designs created in Query Studio can be read and modified in Report. Report Studio is a tool for Report Authors. This is an application to examine the Online Analytical Processing (OLAP) cubes and search business data in a multidimensional way. With this application huge amount of data can be examined through ranking, complex filtering, slicing, dicing and creating custom subsets. Cognos analyst studio is useful for business analysts. By using Cognos Metric Studio, scorecarding can be prepared, which helps to manage the performance by observing and analyzing the metrics at all levels of the organization. The idea behind it is to place the performance indicators next to the organizations key performance measures (red, orange, green status notation) and link them to reports containing related information. Event Studio is a process which runs in backend and monitors the data and reacts when something occurs which may cause a business problem in the future. Event studio automatically generates emails, running reports, updating news channel in a corporate portal or communicate with other software. Cognos query studio is a tool for creating basic ad-hoc reports and a lighter version of Report Studio. Cognos query studio allows users to create one page report at a time. This tool is useful for Report Authors and Query Authors. Cognos Connection is a door way for Cognos 8.4 and it is a component to relate with the Content Store. It is a frontend to publish, find, manage, organize, and view organization’s business intelligence data. It is a database where the metadata for the entire Cognos 8.4 component is stored and managed centrally. By using framework manager content store can be accessed. Framework manager is a Cognos 8.4 tool for creating and managing business-related metadata for use in all Cognos 8.4 BI applications. Framework manager is mainly useful for data warehouse developers and data modelers.